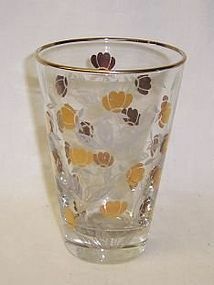 This is a really nice, hard to find, Autumn Leaf 4 5/8 inch high Water Tumbler with an all over Autumn Leaf pattern in 22K gold and etched frost motif with safe edge gold rims made by Libbey to accompany the Hall China pattern. The Tumbler measures 3 1/8 inches in diameter at the top and is in very good condition with no chips or cracks. The gold decoration and frosted motif decoration is all very good. This tumbler is listed in the Whitmyer Hall China Book, pages 48-49. Be sure to search our Hall China available. We guarantee all items to be as described. Feel free to email with any questions. THANK YOU.